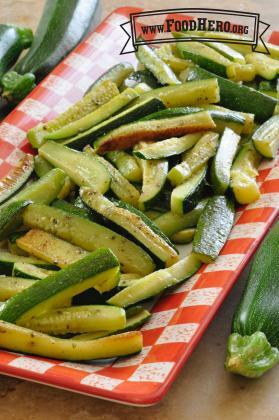 Wash zucchini and cut into 3-inch lengths.Then cut each 3-inch section into ½-inch thick sticks. In a bowl or plastic bag, combine zucchini sticks with oil, garlic powder, oregano, salt, and pepper. Place in a single layer onto a large baking sheet. Be careful to not crowd the pieces of zucchini. Lining the baking sheet with foil or parchment will help with cleanup. Bake in the preheated oven for 12 to 15 minutes, or until lightly browned but still tender-crisp.